Now you can hand-load your 30 caliber handgun or rifle to shoot hyper-velocity .224 caliber bullets! Fit the .224 bullets into our Sabots with the Sabot Bullet Seater die. Then load the sabots as you would any .308 caliber bullet. 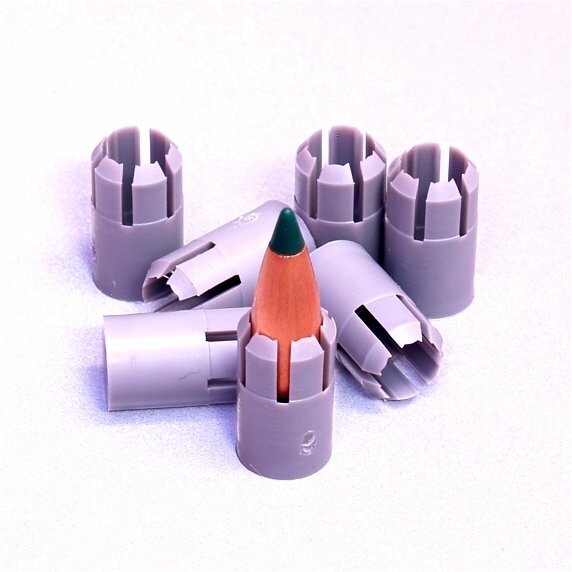 The Bullet seater die is required for consistent seating of bullets into the sabots… accuracy requires consistency! Shoot to 3,500 fps in a 30-30... 4,200 fps in a 30-06. 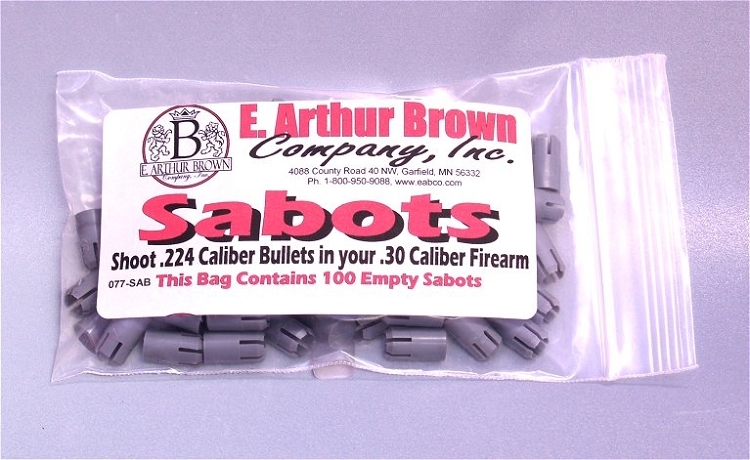 Free Load Data is Included with Every Sabot Order! Sabots flower away from the bullet after exiting the muzzle. Made of injection molded plastic, sabots won't harm your barrel and bores are easy to clean with Hoppes #9. On-Line Load Data - It includes advice for developing your own loads for various .30 caliber cartridges plus specific data for 30-30, 30 Herrett, 30 Carbine, 308, 30-06, 300 Win Mag, 300 Weatherby Mag, etc. Click Here! VOLUME DISCOUNT: Click "Quantity Pricing" for 5 or more bags. I grabbed a pack of these to try in my Krag, and have to say they shoot beautifully straight with a 55grain fmjbt bullet! I also purchased the press adapter, but found the sabots accept most bullets easily, but still hold them firmly once they bullet's in the sabots. Lightly crimped ahead of 40grain of IMR 4064, they flew straight without issues! I tried them in the magazine and they appear to feed perfectly, but have not tried firing them with more in the mag so I can't tell you whether or not the recoil may dislodge them from there cases. I chose to load and fire them individually. Definitely an enjoyable round to shoot! Quick and Easy to put together. Only problem I ran into when using them in the M1 Carbine is that upon cycling into the chamber the bullet and Sabot separated. This was not an issue in a bolt action. long range varmint loads in a .30-30 who could ask for anything more? These are excellent especially since you can't purchase accelerators any longer. You must load your own.. These failed miserably for me. I loaded these for .30 Herrett in two different barrels: one with a rifling pitch of 1:10, the other 1:14. It appears the sabot were not gripping the rifling properly; the bullets were not stabilized. Elongated bullet holes, some 90 degrees off axis. Velocity was about 2500 fps. I don't know what happened. I've been handloading for 37 years. - EABCO Response - I can see where the 1:14 slow twist barrel might not stabilize and cause keyholing. But the 1:10 twist barrel should have been sufficient. Might try some copper removal with bore paste to improve sabot/rifling engagement. I have been reloading for a long time , i bought the sabots to see if my 308 would be faster , and it went from 3,500 to 4,200 i chronograph, my reload 3,700, factory fmj 3,500, and then the sabots 4,200, which was a 55 grns 22, the others where 180grn, and its cheaper to load , this is just my experience on my weapons, thanks for taking the time to read this hope it helps , and I didn't need the bullet seat ,cause I have the RCBS MICRO BULLET SEATER, IT SEATS THEM 0.0001 CLOSE ENOUGH FOR ME , LOL BE SAFE. A blast from the past. Loved these back in the 80s. The main issue with nonfrangible Sabots are they tend to effect accuracy. Sabots arrived in timely fashion and with printed material for the reloader's use. Then I went into hospital with some serious problems and only very recently was able to open a packet and reload some of them. Everything went well except for my finding five sabots that would not center a .22 projectile because the inside base had no shelf to align/hold the bullet. Five of 200 is not a high percentage, surely, but it does leave a question at the back of my mind about the centering/alignment of those I already loaded. I intend to go to the range soon as I'm fit and shoot them and enjoy them. At any rate, thank you EAB, and I will buy again. Your shipping time was incredibly quick, especially during the Christmas shipping crush! Thanks for sending the additional Reloading Data for Sabots. I've had a seven year old shooting nickel sized five shot groups at 50 yards, off hand, with a 30-30 Marlin Youth 336 mounted with a 2-7x scope. I'm impressed with the accuracy achieved. Note: We only load one in the magazine, one in the chamber to prevent primer ignition in the tubular magazine. Great prairie rat load to say the least. Will be giving it a go with coyotes soon. Have tried all types of 22 caliber bullets in the sabots and the fit into the sabot, and the seating into the rounds (from 30-30 to 300 mag) has been flawless. Thanks for the great products and service! I very much miss the Accelerators and was very happy to find, but, load, and shoot my own loads with these sabots. Have been working great with no defects in the batches I've purchased. 90 of these where of good quality and 10 of them the bullets fell out after loaded. So far doing well, fairly consistant at 4000 fps. Getting 1.3 at 100 yds. Haven't had the chance to do any accuracy or velocity tests yet. Did load some for my 300BLK, and they preformed fine.....will load more and chrony them and repost the results. Quality is reasonable, just had a few where the small edge, just below the fingers, was missing, otherwise they seem pretty uniform. I haven't had a chance to shoot any yet, but they are just what I wanted. Much cheaper then trying to buy the Remington Accelerator ammo at gun shows. I found that I can seat the bullets in the sabots quite well using my .380 seating die. Works great in my 7.62 x 39 TC pistol! Very happy with my purchase and your company. Will be shopping/buying again! Thank-you! These sabots are the best thing for many reasons, they let me train my kids on how to shoot bigger rifles with little to no kick with little price for reloading. They are accurate and very repeatable. Also great for varmint hunting! First pack I opened had 23 miss-formed sabots and I was quite disappointed. I called EAB and they made it right by shipping 2 replacement packages out, no charge. Hard to complain about their service but the quality control of their supplier on this product was sleeping at the wheel the day they packaged mine. These are great. I am using them with 55 gr. Hornaday Vmax's in my Finn Mosin. Took a bit of trail and error to get the correct charge. but eventually I got acceptable groups with little to no recoil. Will order more soon and do more load testing. Won't drive tacks but will drop white tails.